Deciding upon which type of Pressure Washer is right for you can be a daunting task and they certainly come with a whole range of price points. Do you go cheap or premium? Should you be opting for electric or gas powered? Are you just going to be cleaning your patio and your car or do you have decking, garden fences, a 4X4, and a caravan to also deal with? If so, do you need something that’s portable and has wheels so it can be maneuvered into position or a is a station pressure washer going to do the job? There’s so much to consider but not to worry, our expert guide will help you pick out the Best Pressure Washer for you and the one that should fulfill your needs. So let’s delve into the review and uncover our range of efficient and powerful home pressure washers. The Sun Joe SPX3000 is certainly one of the most popular pressure washers out there if the customer reviews and feedback are anything to go by. It’s easy to use, although not quite so easy to assemble, and is very competitively priced, considering its functionality. 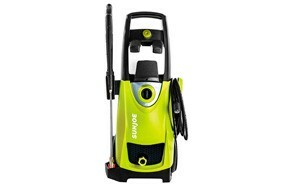 It performs well cleaning cars and driveways and is quick and efficient at removing dirt and debris. It has an outstanding maximum pressure of 2,030 PSI and a good water rate flow of 1.76 GPM. There’s an easy to use pressure gun which features a trigger locker for added safety, and it’s highly portable featuring excellent wheels that make it perfect for moving around a potential project site. There are plenty of accessories included with five nozzles that deliver a 0-degrees, 15-degree, 25-degrees, 40-degree as well as a soap specific nozzle. The nozzles themselves are color-coded and easy to connect plus they store away conveniently in the back of the machine for easy access. The Sun Joe also has two onboard detergent tanks which mean you can switch between two different mixtures. It’s also a relatively quiet machine too, especially considering how powerful it is and comes with a 20-foot hose and a 35-foot power cord. Overall a great pressure washer and our Best Choice of today. Be sure to also check out our list of the best cordless lawn mowers for more great items like this. From reputable brand Karcher, this is one their highest power electrical machines and features their patented induction motor which can increase the life of your machine by up to 5 x because of its water cooling effect. Great if you are keen to invest in something that is designed to last. With a powerful 2000 PSI and 1.4 GPM, you get a good, quick water pressure and with the addition of both a Vario and DirtBlaster wand attachment, it can make short work of most outdoor cleaning requirements. There’s also an onboard detergent tank fitted so that you can add an appropriate solution to tackle those problematic cleaning jobs. This is the perfect domestic pressure washer for those of our who enjoy a clean home and garden area. It delivers up to 40 times more pressure than a garden hose and features a built-in hose role that not only helps to prevent kinks in the hose but also makes winding and unwinding the 25-foot hose a breeze too. It’s definitely been designed and manufactured to withstand the rigors or regular residential use and has a quiet and long lasting patented motor and delivers a low energy output. It also comes equipped with 7.7” high impact wheels and features a durable handle, so it’s perfect for maneuvering around your home, backyard or patio and decking area. Karcher not only offer a 2-year warranty but they also have a rapid exchange program in place which means you get quick and free replacement parts while in warranty. The HydroClean from ROAV is all about making outdoor cleaning easier, whether that applies to your car or your decking. This powerful and well-built electric pressure cleaner with its 2100 of PSI pressure power can literally blast away accumulated dirt and grim from walkways, pavements, porches, and cars, leaving the exterior of your home looking just like new. It comes with a built-in detergent tank so that you can add a soap or detergent of your choice plus there is an easy to operate trigger spray gun that you can perform with one hand and which makes targeted, on the spot cleaning a complete cinch. Your ROAV comes fully loaded with all the parts and accessories you will need to get pretty much any job done and is fully customizable. Whether you are using your electric high-pressure washer to remove caked on dirt from patios or car wheels, it will leave them all looking sparkly and new. Even use it to hose down external walls, ensuring your house looks pristine and clean. It sets up in minutes and has a long reach so that you can get to all the areas you need to clean. Talking of which, it’s totally portable too with sturdy large wheels and a large carry handle. Our handy guide to the best robot lawn mowers features more great products like this. With the power of a Honda engine at its core, this commercial style Simpson pressure washer will certainly deliver high pressure as well as high performance too. With a seriously impressive 3200 PSI and 2.5 GPM there’s not much that this mean cleaning machine can’t tackle when it comes to dirt and grime. While it is gas powered, it should be maintenance free thanks to its long-lasting Axial style pump. There are also 5 easy to connect nozzles delivering targeted spray at 0-degrees, 15, 25 and 40-degrees as well as quick connect option for soap. The high-pressure washer is durably constructed from a black steel frame that has been powder coated for corrosion and rust protection yet it is still mobile thanks to those four-ply premium pneumatic tires. These deliver incredible stability and shock absorption. It’s versatile, ergonomic and high performing and provides optimal performance, with minimal effort, working on fences and patios, driveways, porches and patios, all kinds of cars and larger vehicles as well as exterior wall and paintwork. With a focus on manufacturing high quality and innovative outdoor power equipment, you can depend upon Sun Joe to get those chores done quickly and effectively which is why this next electric pressure washer makes it onto our best of list. With the SPX4000 electric powered high-pressure cleaner, you can easily tackle even the most stubborn and toughest of cleaning projects. Whether you are working on your home, outdoors or even a car, it has two settings (high and low) so that you are entirely in control of the pressure setting opting for either 1450 PSI or 2030 PSI. That lower setting is perfect for everyday grease and grime whereas the higher pressure setting is capable of tackling even the toughest cleaning jobs. Packed with 1800 watts of power performance and a 14.5 amp motor this Sun Joe pressure cleaner also comes with five quick connect tips allowing you to customize the flow from a gentle spray to a more powerful blast. There’s also a sizeable onboard detergent tank to give your cleaning results a real boost plus a Total Stop features which save energy and prolong your pump life when the trigger is not in use. Love this product? 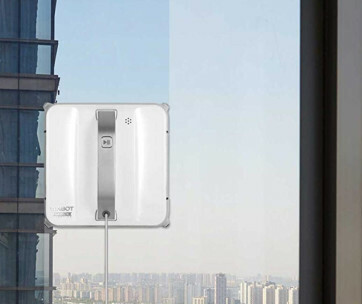 Check out our review of the best robotic window cleaners for our top picks. 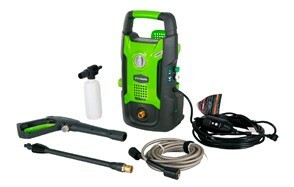 Coming up next in our Best Pressure Washers review we have our Best Value choice which is from Greenworks. While it’s not the most powerful of the units we’ve recommended today, it’s portable and practical and is a budget-friendly solution. It can also very conveniently be used in either a vertical or horizontal position which provides for greater stability. The 1600 PSI and 1.2 GPM is enough to blast through everyday dirt and grime to restore lackluster and dirty, tired looking surfaces to their former glory. It also features a generous length 35-foot power cord and has a 20-foot high-pressure hose, so the combination of both delivers great reach. You can also purchase a great range of additional accessories and nozzles which will transform the functionality of your Greenworks pressure washer even more. A practical solution for homeowners short on time, money and space. 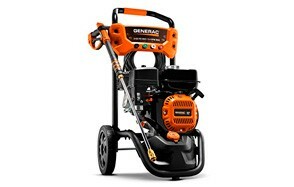 It’s the turn next of our Premium Choice pick in our Best Pressure Washers review, and we’ve gone for the Generac 6923. This is a gas powered washer and is undoubtedly very user-friendly and incredibly versatile. It’s constructed from a durable powder coated steel frame which sits on your pneumatic tires that will never go flat. It also has a foam grip for your comfort and convenience during transportation. With an enormous output of 3100 PSI, it makes short work of those troublesome tasks around the house like cleaning concrete and decking. There are two angled degree tips as well as an additional chemical tip for use with detergents and soap. The tips are easy to change and can be stored away in the unit for easy access. The spray gun itself has a comfortable and ergonomic grip handle that is easy to control, and there’s a 25-foot long hose that conveniently connects to the back of the high-pressure cleaner. In a horizontal design, it’s mobile and can be transported easily from one place to the next. It’s compact, versatile and delivers professional cleaning results. 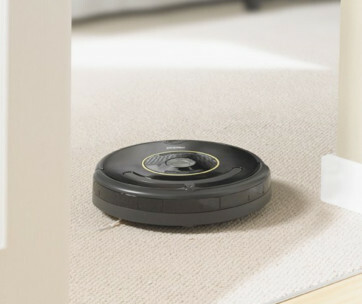 Find more great products like this by checking out our guide to the best robotic vacuum cleaners. The Ryobi pressure washer is an excellent choice for homeowners looking to invest in something that is powerful, practical and versatile. The system is easy to use, and the onboard controls are intuitive and straightforward. It requires very minimal maintenance thanks to that Axial pump and is also pretty easy to assemble and to transport too. With 2300 PSI and a 13-amp motor, it’s pretty powerful and great for a wide range of cleaning jobs around the home. The brushless motor design helps the motor to run smoothly and gives it a longer life expectancy. It comes with a comfortable foam topped handle which makes the unit easy to transport around along with those over-sized 12” wheels too which work across all terrains. There’s an onboard detergent tank while the power cord is a lengthy 35-feet and the hose itself is 25-feet making it a practical solution. The Ryobi comes with three quick release nozzle attachments for your convenience, a 15-degree, soap and also a turbo nozzle. It performs well as a medium-duty pressure washer and really does work very effectively in a whole host of cleaning scenarios. Coming from Briggs and Stratton as you would imagine, this is a practical choice if you are looking for a pressure washer to tackle lots of smaller projects around your home. It has reliable and dependable, good-looking design and comes with a quiet universal motor as well as instant Stop/Start technology which makes it an economical choice. 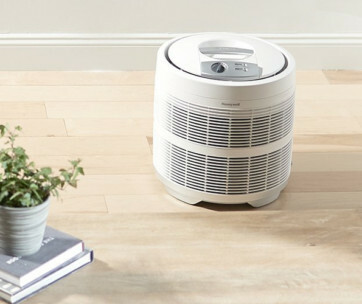 The unit itself is sturdy, and it features a convenient carrying handle and wheels for easy maneuverability around the home. With a detergent siphon hose, you can upgrade your pressure washer instantly into a siphoning cleaning solution. The high-pressure hose itself is 26-foot long so allows you to cover off a large cleaning area. It’s a smart choice and a wise investment which is why it’s made it safely onto our Best Pressure Washers roundup. Don’t forget to also check our guide to the best shower squeegees. This PowerBoss commercial style gas pressured power washer may be the last of our product recommendations to be reviewed on our Best Pressure Washer review, but it is by no means the least! Powered by a Honda OHC motor, it’s fantastic for cleaning decks, patios, and fencing and comes with a minimal maintenance Axial pump. It features Easy Start technology and can produce 2800 PSA and 2.3 GPM giving it just about enough power to clean any project, no matter how dirty it might be. It makes the ideal pressure cleaner for medium-duty tasks and comes with 3 Pro-style spray tips which feature Quick Connect and Disconnect so that you can easily switch between your personal cleaning requirements. Use the 25-degree setting for gentle rinsing, the 0-degree for scouring and your Soap nozzle for applying detergents for a targeted boost. There are also two 10” tires that never run flat and which will easily transport you from one cleaning project to the next. We literally spend 100’s of hours researching the various different types of pressure washers on the market, checking out extensive consumer reviews and feedback as well as reading professional opinions about which brands and features are the best to look out for when investing in a new pressure washing machine. Our Best Pressure Washer guide aims to be wholly representative of the category and to have a range of brands and price points to suit all budgets and all requirements. We hope and trust that there will be the perfect high-pressure cleaning machine for you among our best of recommendations. Choosing the best pressure washer for you will depend upon what you think you’ll be cleaning regularly but also how dirty it’s likely to be. You need to have a machine that delivers the right amount of power for your purpose, and besides that, there are a range of other key features that should inform your buying decision to ensure you invest in the right high-pressure cleaner for you. We’ve listed out below some of the most common parts and accessories of your power washer. Power Source - Decide upon whether you want to go for a gas or electric powered source. Gas pressure cleaners have engines whereas electric cleaners have motors. Purpose - We’ve already mentioned this but depending upon whether you have a few small items to wash like bicycles and garden furniture or a large car and substantial decking area will determine whether you can go for a portable style universal pressure washer or whether a commercial water cooled style machine will be more suitable. Water Pump – The vast majority of washer pumps that are used for residential purposes use an Axial pump which is of mid-range quality. Heavy duty expensive units deploy a Triplex plunger pump. Most entry-level pressure washers have a Wobble pump which is neither replaceable nor is it repairable but it should be good for 3 years. An Axial pump will last 3 x that of a Wobble pump whereas a Triple, with proper care and maintenance, will last 10 x that of an Axial pump. Weight & Portability – You need to consider the weight of your pressure washer, especially if you are going to need to use it around your home. Electric pressure cleaners are relatively lightweight coming in at around 20-45 pounds whereas a gas-powered commercial pressure washer will be a great deal heavier and could max out at as high as 100 pounds. Look for something with wheels and a carry handle for your convenience. Hose – Your high-pressure cleaner will, of course, come with a hose that will vary significantly regarding length, diameter, material constructed from and also its connection type. The most frequently utilized is a ¼ inch hose although professional models may have a 3/8-inch hose that will deliver a higher flow of water to tackle commercial style cleaning jobs. There are two main types of pressure washer, and it’s pretty much down to what kind of tasks you will be needed your machine to perform as to which will ultimately be more suitable. You can go for either an electric pressure washer or a heavier duty styled petrol-powered pressure washer. Gas-powered machines tend to be better suited to more commercial or heavy-duty tasks as opposed to your general car and patio scenarios. They also have a much higher maximum pressure reading and are likely to be more expensive and difficult to manage but deliver exceptional results. You should get clear before you invest in a pressure washer the kind of tasks you will be performing with it as that is going to determine which type you ultimately go for. A good electric pressure washer should be more than adequate for pretty much all domestic cleaning tasks. Buying a pressure washer can be a significant investment, so it’s always best that you thoroughly do your research first and ensure that you are purchasing the correct machine for your individual requirements. We’ll go on to look at some of the things you should know and terms that you will see referenced alongside pressure washers but there are three basic categories of cleaner, and they are distinguished primarily by their BAR rating which is the amount of pressure they deliver. Entry level cleaners will have a top Bar of around 100 and be great for smaller items like bikes and garden furniture, or a lightly soiled patio. Mid-level cleaners will have a Bar of between 100-120 and are more intense so better at getting into the nitty-gritty of garden fences, dirty cars, and your decking. Heavy duty cleaners will have a Bar of over 120 and can easily tackle stained paving and pathways and muddy 4x4’s. You should also be aware of the water flow rate too as this indicates just how much water than flow through your machines. The more water your machine can deliver, the quicker you can get the job done. Most machines will provide an average of 400 liters per hour so check that rating too. Also, make sure that your machine has an adequate hose length. You could use an extension lead, but it’s far better to have a longer length hose otherwise you run the risk of mixing water with electricity outdoors which is never a good idea! PSI – Pounds Per Square Inch – This is the measurement for denoting pressure. The most common range being from 1000-3500 PSI. This describes the pushing force although the actual power will be determined by the nozzle. GPM – Gallons Per Minute – This is the rate at which the water flows with the range being usually from 1-5 GPM. More flow equals faster results. CU – Cleaning Units – The cleaning power which is also known as the cleaning unit is the calculation of the PSI x GMP. This is a common term which will be used to describe the cumulative cleaning power the washer you have is capable of delivering. Q: Is pounds per square inch (PSI) or gallons per minute (GPM) more important? A: They’re both as equally important as each other and are worth understanding and taking into consideration. The PSI will indicate how much you’ll be able to clean off a surface whereas the GPM will tell you how much rinse you’ll get from your machine. For a farmer, the GPM will be more critical as their principal concern is fast rinsing and flushing. Someone tasked with cleaning up dirt and paint from concrete and paving though is likely to be more interested in the PSI measurement. Q: Will washing my car with a heavy-duty Pressure Washer damage it? A: Pressure Washers are entirely safe to use on cars but be cautious if the make and model you own has a particularly high PSI. Exercise care when working on detailing and paintwork. If you are wanting to use a pressure washer specifically to clean a car, then you are probably better going for an electric rather than a gas powered one. A: Absolutely, hot water cleans far better than cold water. There’s a reason of course why both your washing machine and your dishwasher use hot water! You can purchase a hot water machine, which is more expensive but will be more reliable. With a hot water pressure machine, the temperature should heat up to 140F (60C). Q: What chemicals can be used with Pressure Washer? A: Just like with any cleaning process, including your clothes washing or doing your household dishes, two things are required in order to deliver the best results. Hot water and an appropriate source of soap or detergent. Your pressure washer is no different in that respect, and it’s a scientific fact that when you apply pressure to hot water, it’s more effective at pushing grime to the surface which by using a chemical or detergent then attracts itself to the water to wash away the dirt and oils faster. Using chemicals, of course, does come with risks and hazards that you should be aware of, especially if you have pets and children around or are using a pressure washer in your garden where you have plants and vegetables growing. Soap is a naturally derived detergent made from fats and oils from plants and animals and is much safer to use than a chemical detergent. A chemical detergent is man-made and synthetic. Professionals save money by buying concentrated chemicals in bulk form and mixing and watering that solution down, but for most domestic uses, pre-mixed chemical cleaning concentrates can be purchased that will have the safe levels of detergent already worked out. Always check the labels clearly to make sure that you are using the right chemical for the appropriate job. Alongside cleaners that are intended to remove dirt, you can also buy sanitizers which kill germs and bacteria and disinfectants too. Q: What type of oil should be used in the pump? A: Just like a car engine needs oil to run smoothly, so too does a gas pressure washer. That’s simply because they need to remain lubricated to work smoothly and efficiently. There are two types of oil that you can use for your gas-powered high-pressure cleaner. You can go for either an All-Purpose Engine Oil which is recommended for temperatures above 40-degreesF or non-detergent pump oil. Non-detergent oils were particularly popular before oil filters became so prevalent. The reason being that they encourage contaminants to stick to the sidewalls of the pressure washer rather than causing a build-up of unwanted sludge or dirty oil. Always check your manufacturer’s handbook first. A: In order to get the best performance from your investment, it’s important to ensure that your high-pressure washer is running smoothly and that clogged nozzles are swiftly dealt with so that the water can flow free. Before attempting to clean out a nozzle, always disconnect your spray wand from the gun first. The nozzle should be cleared out with something like a piece of wire or perhaps a paper clip. Once you’ve dislodged any debris, flush the nozzle completely with water before reconnecting the gun. Restart the pressure washer to check that the nozzle is now thoroughly unclogged by depressing the trigger on the spray gun to test the water so to speak! If it still seems like it’s partially plugged, just repeat these procedures again. A: It’s best to store your pressure washer away somewhere clean and dry, especially over the harsh winter months, so consider putting it inside your home, a sealed water-tight shed or garage. Just make sure that you use it one last time before you store it away to ensure that you’ve put it away in full working order. If you do have a gas powered machine, ensure that the tank has been emptied before you store it away too.